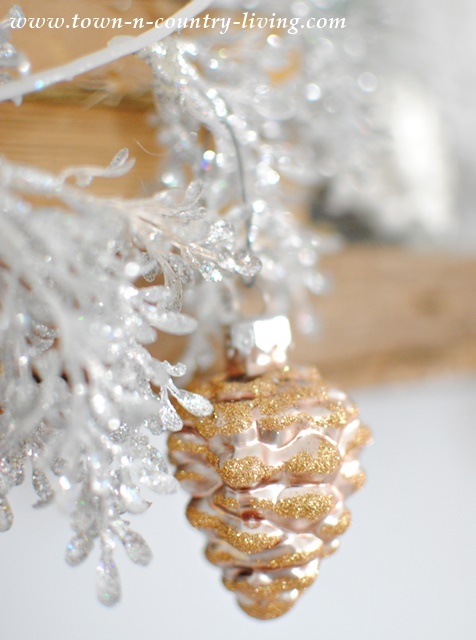 When I think of Christmas, I think of glitter and sparkle … the way pure white snow sparkles in the sun. I love color at Christmas, including silver and gold. 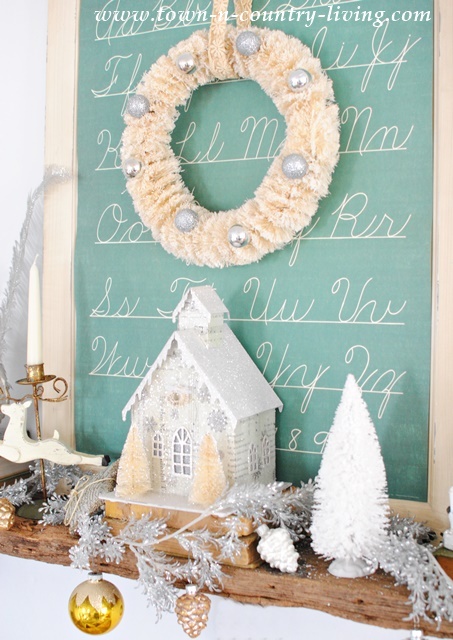 I found some beautiful, blingy holiday pieces to create a vintage Christmas mantel. 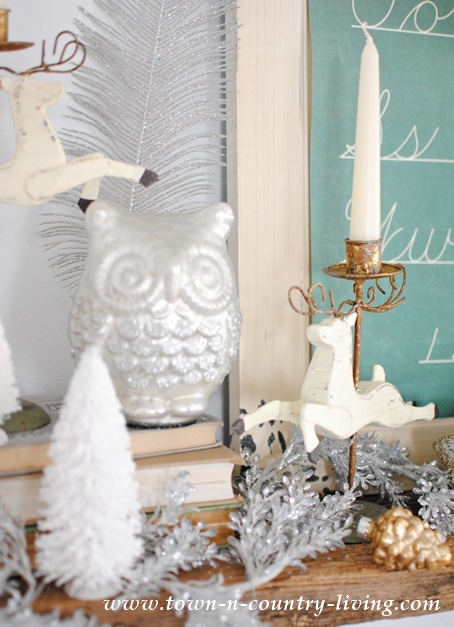 I’m sharing my holiday mantel today along with some of my blogging friends. Links to their Christmas mantels are at the end of this post. I have always loved these sparkly Putz houses and finally found some at half price. 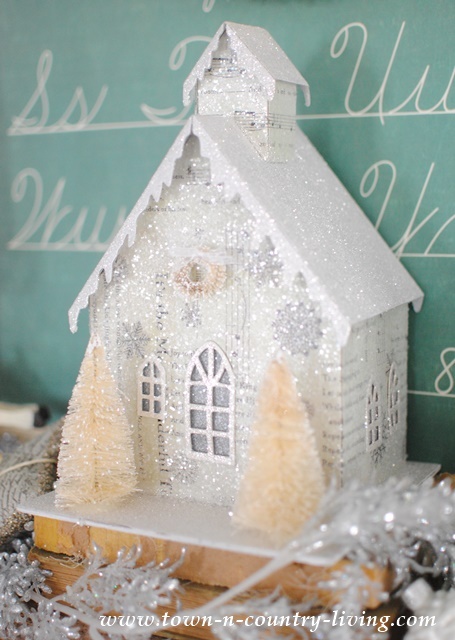 All the glitter makes the little house look like it’s dusted with sparkly snow. 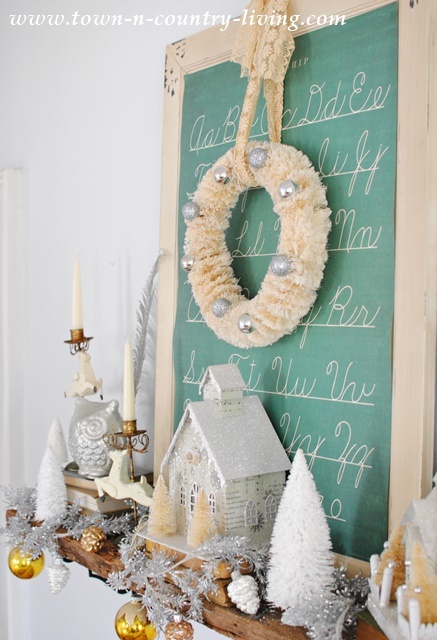 A bottle brush wreath with glitter ornaments seemed like the perfect addition against my penmanship poster. A silvery sparkle leaf garland adds a bit of bling to the barn wood shelf. Glass blown pine cone ornaments hang over the side with the sparkly garland. 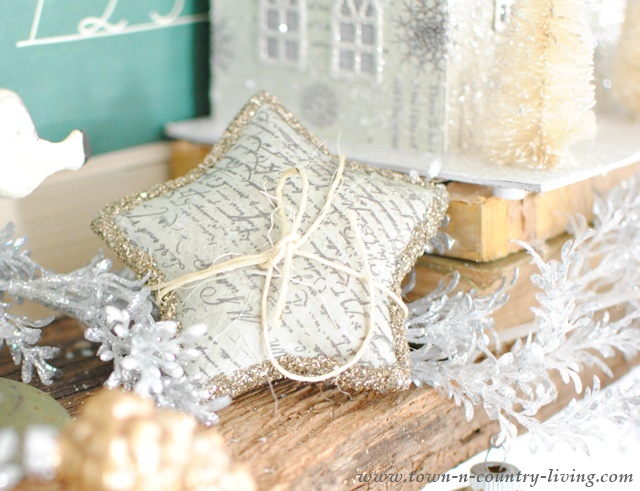 I found this pretty, script Christmas star edged in gold glitter at Home Goods to adorn the vintage Christmas mantel. … while a glittered Putz church keeps watch at the other end. 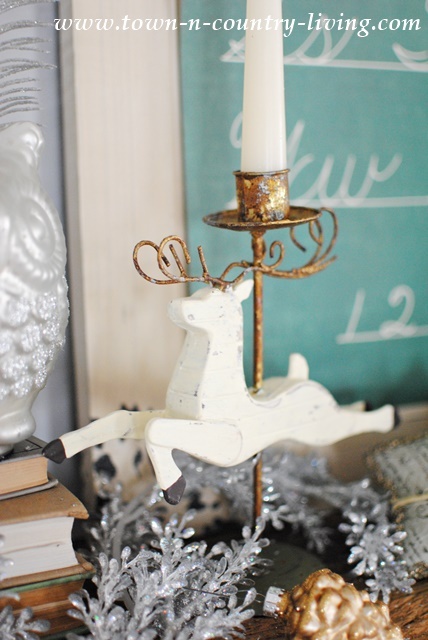 I found a set of 5 of these reindeer candlesticks at the flea market. To add a bit of Christmas green, I layered a penmanship poster over a wooden print. 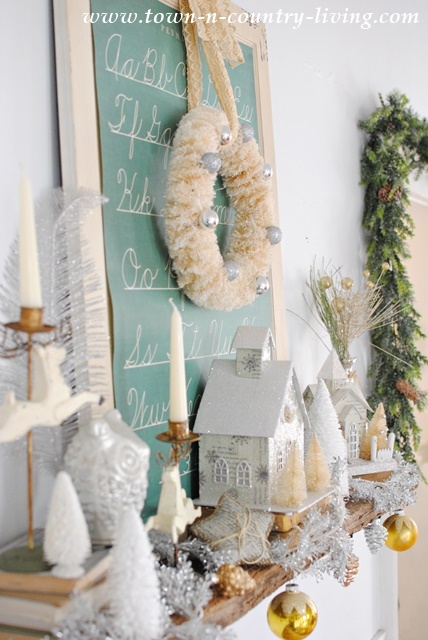 Thanks for stopping by to visit my vintage Christmas mantel! Head over to yesterday’s Modern Country Table Setting post to enter my Bormioli Rocco dinner and glassware giveaway valued at $200. The dinnerware will be shipped to the winner before Thanksgiving. 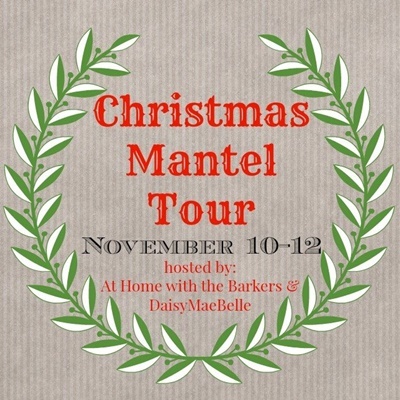 I always appreciate your visits and hope you’ll visit some of my friends below who are sharing their Christmas mantels this week, too. 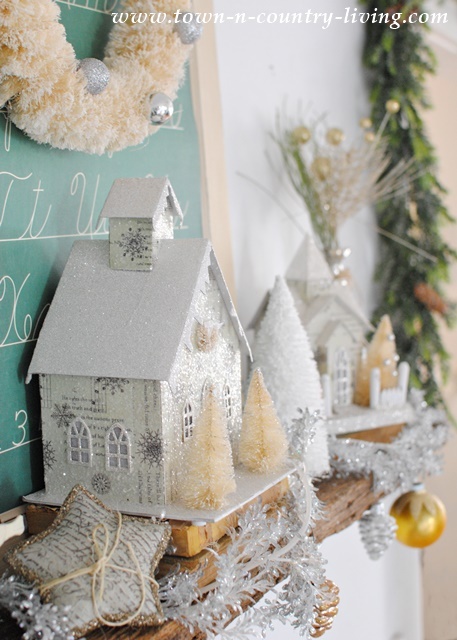 I’m sure you’ll find some inspiration to create your own Christmas mantel! I love every sparkly inch of your mantel! Just Beautiful!!! Love all your vintage touches and the aqua and gold look great together! Thanks so much for inviting me, Melissa! 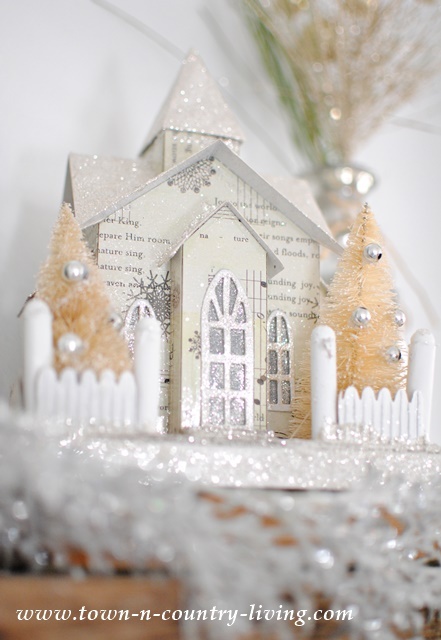 Such a gorgeous winter wonderland vignette. I love your church, beautiful. BEautiful!! I love every detail. And those houses are fabulous! Looks Beautiful.. I Can’t wait to decorate for Christmas!! Jennifer your mantel is so beautiful in all of it’s sparkly glory!! I love the vintage details and just how soft and light it feels. Absolutely gorgeous! Thanks, Robin! I wish I had more of the glitter houses. Love them! I have a collection of vintage Putz houses that I gave a rest last year but I think I’ll get them out again this year. 🙂 I also have a couple of the new larger ones which I use in the family room. I love vintage ornaments a lot! Your mantel looks so pretty! your mantel is so calm and peaceful. I love the chalkboard poster as a backdrop…that’s genius. entering your giveaway as soon as I leave this comment. Oh those bottle brush trees! LOVE them!! All really beautiful Jennifer! What a beautiful, whimsical, vintage mantel…. so pretty! Pinned! Love being on tour with you again! Gorgeous!!! Love love love your mantel! Just my kind of style. Beautiful! Where did you get your penmanship poster?